If you are going to be within reach of Milan this summer, here is our pick of both traditional and unusual events to attend in August and September. [Leonardo, Politics and Allegory] Biblioteca Ambrosiana, until 5th September. This is the Gallery’s fourth exhibition of drawings and papers from Leonardo da Vinci’s “Atlantic Codex”, which describes his political thinking. The drawings reveal a cosmopolitan Leonardo who was well-informed about the events of his time. There is also evidence of how much he valued freedom, which he called “nature’s most important gift”. The exhibition is open Tuesday – Sunday from 09.00 to 19.00 and tickets cost from €15.00 - €10.00. This is a delightful show of 110 paintings from the 1930s Chiarismo movement, which was founded in Milan. Chiarismo, a term coined in 1935, refers to paintings by a group of young Milanese artists who used light colours and symbols of light in their work. 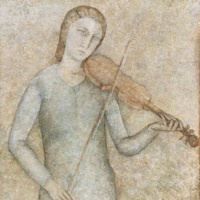 The best known of these artists is Francesco De Rocchi [1902 – 1978]. Half the exhibition is devoted to the Chiarismo movement in general and half to De Rocchi. The exhibition is open Tuesday – Sunday from 09.30 – 19.30 and on Mondays from 14.30 – 19.30. On Saturdays it is open until 22.30. Tickets cost from €8.00 - €6.50. August is the month when the Milanese, like most Italians, leave the city for cooler air and a lot of regular events such as markets do not take place during this month. 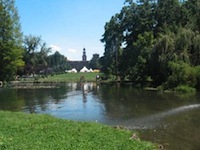 However, the Sempione Park, which was once part of the Sforza family’s estate, will become a “sports village” throughout August and visitors will be able to practise all kinds of sports there between the hours of 11.00 and 20.00. If you don’t like sport, the park has many interesting and charming features and deserves a visit in its own right. This market, in fact, takes place all year round on the last Sunday of the month, except in July. You will find over 400 stalls in the area between the Naviglio Grande and Naviglio Pavese Canals and the stallholders will be selling everything from old books and antique furniture to postage stamps. Organised by the Associazione Tennisti Omosessuali, this event attracts around 150 players annually. The games are all played on the clay courts of the Tennis Corvetto. During the tournament there will be a special Karaoke Night at the Patchouli Café in Corso Lodi. [The House of Savoy and the Unification of Italy] Spazio Oberdan Cineteca Italiana, until 12th September. If you are interested in the Savoy Royal Family, do check out our news story about this exhibition of some of their jewellery and belongings. 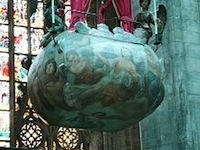 Here you can watch the Archbishop of Milan being carried up to the roof of the Cathedral in an enormous steel basket. At the top, he collects a nail from Christ’s Crucifix and what is said to be a fragment of the Cross, then brings them down to show the crowd. This tradition dates back to 1576. 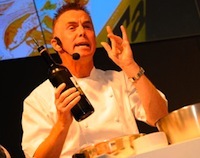 At this event you will be able to taste all kinds of Milanese food, prepared by the best chefs in the city, in the open air. Tickets cost €20.00 for lunch or supper. For more details and tickets, please visit the website.